Campaigners gather to tell MSPs they're 'running out of time' to tackle climate change. 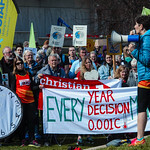 The protest came outside the Scottish Parliament as politicians debated a new Climate Bill that will set the rate of action for the coming decades. Stop Climate Chaos Scotland hold a rally outside the Scottish Parliament.